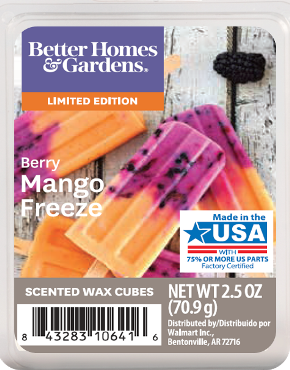 Berry Mango Freeze caught my eye the second I saw it in the wax section at Walmart. I was drawn to the label and the scent name. I could easily imagine fresh and tart berries blended with sweet mangoes drifting through my home. It could smell like a fruit smoothie or a Popsicle. I’m not picky. Sweet strawberry splashed with tropical passion fruit, juicy pineapple, and coconut water. Uh, where’s the mango? I’ve always wondered why they do that? Smelling the wax, berries stood out the most to me and I swear I could even smell an effervescence to it as well. Like a berry soda pop. I couldn’t really smell pineapple or coconut but who knows – if those two make it’s presence known once melting, bring it on. I just hope I smell the mango. That was important to me for some reason. I used the entire clamshell pack (3 cubes each) in two electric melters in my great room. It’s a huge room so two melters works best for me. Once melting, it didn’t take long to start noticing the aroma and it smelled pretty good – and strong. My entire great room smelled like a strawberry and pineapple slushie. I’m kind of guessing on the pineapple part because honestly, this scent was just a hodge podge of berry and sugar that reminded me of a tropical slushie, minus the alcohol. 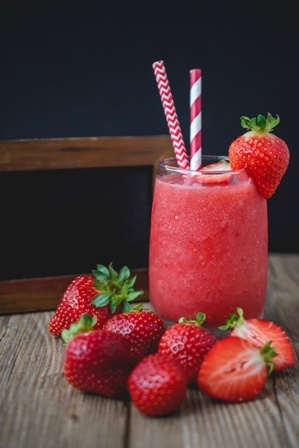 Slushy, popsicle, fruit punch – take your pick or all of the above. That’s what Berry Mango Freeze smelled like to me. I even asked my 14 year old son’s opinion on this one. He said the aroma was super strong and smelled like raspberries and sugar. For a kid, that’s an acceptable guess. If I hadn’t read the scent description or new the scent name, I might have guessed raspberries too. Bottom line, Berry Mango Freeze (that had no mango in it) smelled berry-licious and a scent I still enjoyed. Strength – I would rate Berry Mango Freeze a 10 out of 10 in any size room. It’s a room filler for sure.